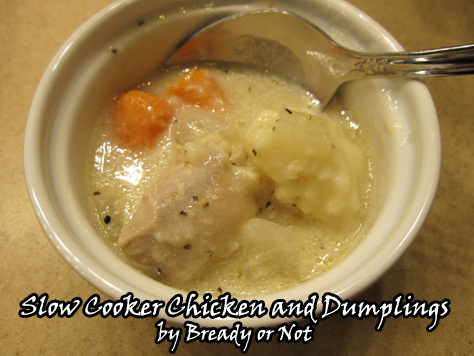 There are a lot of slow cooker chicken and dumpling recipes out there, but I sought out one that makes everything from scratch. I made it, tweaked it, and loved it… so here it is! 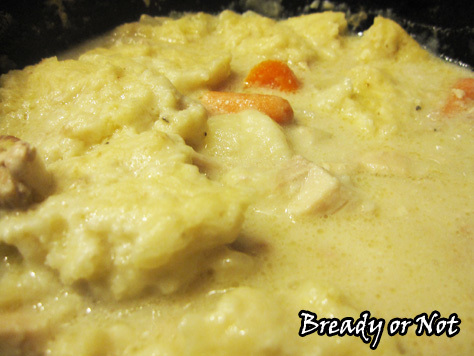 There is just something about chicken and dumplings on a cold winter’s day. It is soul food. The recipe I made for years required me to basically camp by the stove for two hours. I wanted something a lot more convenient. Most of the slow cooker recipes for this use lots of canned stuff and grocery store biscuits. I found a from-scratch recipe on How Sweet Eats and have tweaked it to use less broth, more seasoning, and boneless thighs. I find thighs work a lot better to the crock pot since they are less likely to dry out over the long cooking period. If you’re in need of something to warm your gullet and your soul, make this. The leftovers are darn good for the next few days, too, with or without the dumplings. Modified from How Sweet Eats. 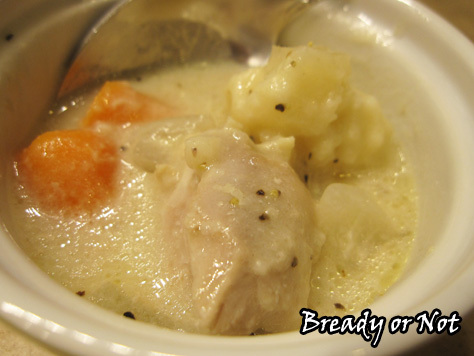 This slow cooker chicken and dumplings recipe is both convenient and delicious. This big pot will feed a crowd or provide leftovers for days. In the bottom of a 5 or 6 quart crockpot, layer the diced onion half, carrots, and garlic. Lay the chicken thighs on top and season them with salt and pepper. Heat the butter in a small saucepan over medium heat. Once it's melted, whisk in flour and cook for 2-3 minutes to create a roux. Once it's golden in color, add 2 cups of chicken broth. Mix it well as it rises to a boil; it'll thicken considerably. After about 4-5 minutes, pour the sauce over the chicken and vegetables. Add the remaining chicken broth/stock. Put the lid on the slow cooker and cook on low for 4 hours. Change the crockpot to high heat. Shred or cut up the chicken; it's okay if it's not fully cooked since it has more time to cook. Stir the half and half into the crockpot, and put the cover on again as you make the dumplings. In a mixing bowl, combine flour, herbs, sugar, baking powder, salt, and pepper. Use a fork or fingers to crumble in the butter until it's evenly dispersed. Add in the half and half or milk until a sticky dough forms. 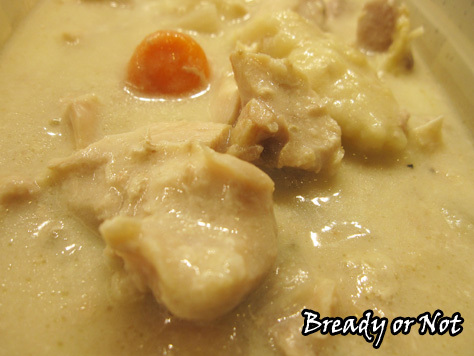 Use a tablespoon to dollop the dough into the crockpot. Cover and cook for another 1 to 1.5 hours. The dumplings will expand to cover the top. The dumplings are cooked when they are soft and no longer raw and sticky in the middle. Serve immediately. Leftovers are fantastic heated in the microwave. If you need to make more dumplings, use the same recipe again and heat the leftovers and fresh dough on the stovetop.